It has been a distressing winter on the news front, and not only for those in possession of a British passport. Hundreds have died crossing the Mediterranean on cheap rubber dinghies, with those surviving doing so miraculously after days on end without any food or water. Supermarket shelves in Venezuela remain barren, as the country continues its spiraling political and economic crisis, while disturbing images have emerged from famine-torn Yemen, where thousands of children have died from starvation since the outbreak of its civil war. These are times when living and studying in the Netherlands should not be taken for granted. There might not be any mountains, volcanoes or national parks teeming with wildlife to keep us occupied on grey wintry weekends. Present, however, is widespread safety on the streets (we’ll leave the bike helmets issue for another article), warm, running water in most households, well-functioning heating systems, and supermarkets and grocers that are heavily stocked with fresh and nutritious products. There are far worse places, therefore, to spend one’s formative years away from home studying to pass a challenging and time-consuming IB Diploma Programme. Pity, then, that for some students, this experience is being soured by ‘the poor quality of food’ provided in the Mensa, to quote from an article published in the previous edition of this paper. Canteen food will always be a bone of contention, particularly if you’re an adolescent with a healthy eating appetite. There are, though, a couple of things worth keeping in mind before passing judgement. Firstly, our school prides itself on welcoming over 100 nationalities. Good luck with coming up with dishes that constantly tickle everyone’s taste buds. Secondly, cultural context. Dutch cuisine features soups, bread, cheese and meat aplenty, with early dinners frequently a feature of daily life. Perturbed by the content of the article, I set out to see what ‘poor quality of food’ is hindering the well-being of our student body, having my lunch in the Mensa on three occasions in the build-up to carnival break. I had eaten in the Mensa on several occasions before, and always walked out a satisfied man. Perhaps, I thought, the criticism was prompted by a downgrade in standards. Far from it. If anything, the food has got better. All three meals came with soups and warm bread for starters, and a selection of fresh fruit and yoghurt for afters. Pleasingly, there was a choice of two dishes as main course, one of which was vegetarian. 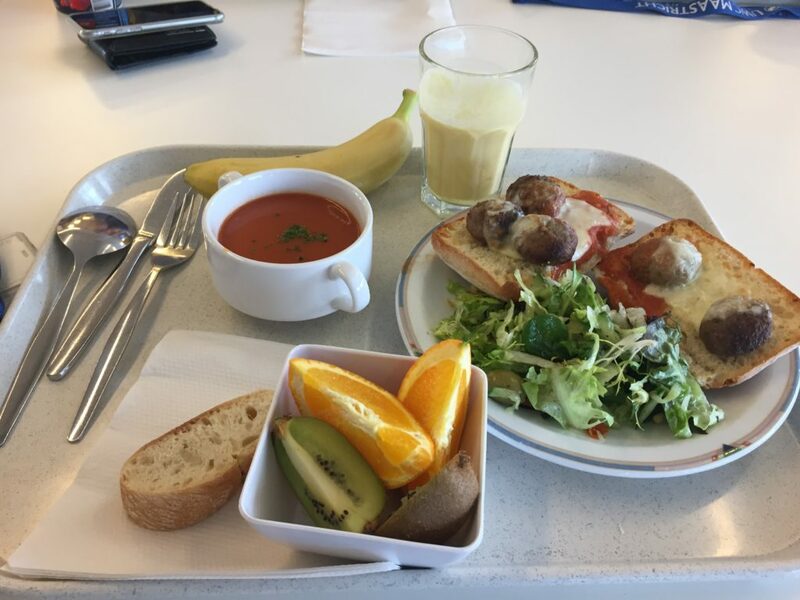 For my mains, I opted for an open-faced meatball sandwich, a quiche and a perfectly cooked sizeable piece of salmon, all of which were watered down with fresh fruit juices or smoothies. Staff, most of whom enjoy interacting with students from various backgrounds, are constantly courteous and polite, and the tables I ate on were spotless. Not many students appeared teary eyed to be digesting this ‘poor quality of food’. The majority were happily munching away and sharing plans for the upcoming break. A sizeable number of staff were also present, a number of whom eat there regularly. On all three occasions, I walked out of the Mensa satisfied and happy with the food provided, just as I had done on previous occasions. The Mensa’s drab décor and rowdy ambience hardly make for an atmospheric meal. Then again, not many school canteens do. But what the Mensa lacks in style it makes up for in service and food. Describing it as ‘poor quality’ is unjust. Probably students in Venezuela and Yemen would agree.